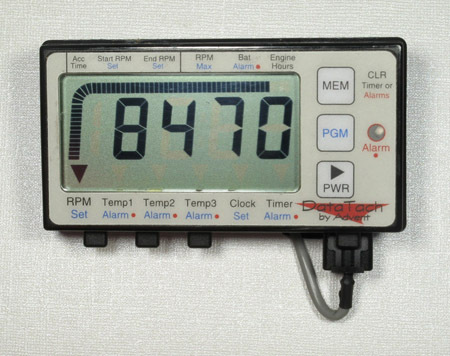 The Sport TACH is designed specifically for the watercraft and snowmobile power sports market and is fully water tight. Its advanced design includes a large, easy to read LCD display and connections for up to three EGT probes. The EGT probes can be used to measure cylinder exhaust temperature up to 1600º F, or water and air temperature from 32ºF. The SportTACH has many unique features including time-of-day clock, trip timer and total engine hour timer. Settable alarms are provided to warn you when EGTs go out of range, or vehicle battery is low. Unique data logging memory records maximum values such as RPM and EGT temperatures from the last six runs. The data of each run is time-of-day stamped so you know which data is related to which run. Optional thermocouple probes These long-life probes are designed to withstand the harsh conditions in the engine's exhaust ports. The thermocouples can measure fast changing temperatures found in the engine. The thermocouples have long leads and water-tight connectors for attachment to the SportTACH.